We grow turkeys for Thanksgiving. They are the most challenging livestock we grow, as the turkey polts are expensive and in the first few weeks the unexplained losses are great. And everyone who grows them reports the same. Then there is a chunk of the summer where they are beautiful, growing like weeds, drinking water from the hose, tearing up thistle to consume every speck of it. 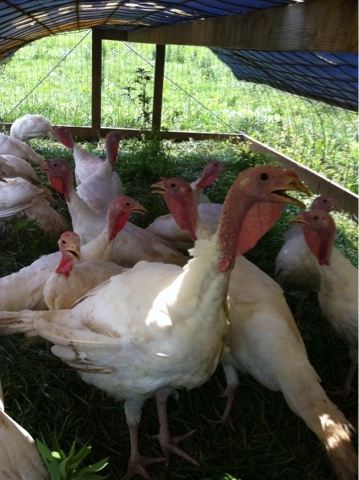 And that is where we are now, with turkeys that are already 10 pounds! York County Buy Fresh Buy Local CSA Day!